An Asea in GTA V.. 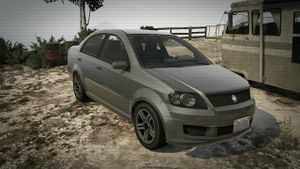 The Declasse Asea is a four-door subcompact sedan in Grand Theft Auto V.
The Asea is based mostly on the 2007-2010 Chevrolet Aveo with some touches of Dacia Logan I. It shares its rims with the Vapid Minivan and the Vapid Stanier. The Asea is powered by a 4-cylinder engine. Coupled with its light weight, acceleration and top speed are good. It is also nimble in handling and grips the road well. Because of its light construction however, its crash deformation is poor - it will take only 2 or 3 hits before the wheels snap off their axles and jam. For reasons unknown, the Asea does not spawn under normal circumstances. The only way to acquire one is before or after the mission What Lies Beneath. The player can choose to kill Abigail Mathers before she gets to her car, or tow the locked Asea before starting the mission. The online player can choose an Asea as their starting car in Mall or Nothing. If they win the race, they get to keep the car. Can be bought from Southernsanandreassuperautos.com after the Business Update. The Asea can be modified in all Los Santos Customs garages and Beeker's Garage in Paleto Bay. It has unique customization options not seen in other cars, like the stickerbombs. An example of modified Asea in GTA V (Rear quarter view).